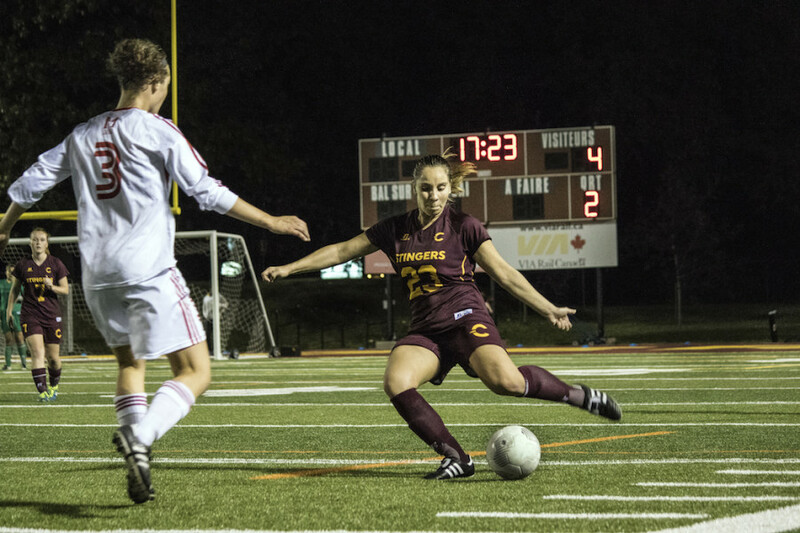 The Concordia Stingers women’s soccer team fell to division leaders, the Laval Rouge et Or, 1-0 on a stormy afternoon at Concordia Stadium this past Sunday evening. Laval’s goal came courtesy of forward Cynthia Turcotte. “It was a really tight game, they had a lot of possession, but we had three good chances that we should’ve just put that ball in and unfortunately it didn’t work out.” said Stingers forward Laura Lamontagne. The Stingers held their own throughout the first half, but were unlucky to concede a goal 20 minutes in, as Turcotte scored on a rebound after an initial save by Stingers goalkeeper Maria Kaperonis. Concordia lacked an attacking threat and succumbed to Laval’s pressing, as they were pegged back within their own defensive zone for much of the first half. In the second half, Stingers posed to be more of a threat, coming close to goal on several occasions, including a shot off the post early in the second half. Sanchez feels his team could’ve taken the game by a score of 2-1 if his team took advantage of their chances in the second half. Despite the loss, Sanchez has both eyes set on the future, as he and his squad to look to improve on the off season. Three players, defender Nicole Middleton, and midfielders Daniela Passarelli and Frederique Labelle–who has been a Stinger for five years, will be leaving at the end of the season. But with 13 rookies on the team this year, the Stingers are adamant they can improve their fortunes for next season. “We feel confident.” said Lamontagne, who feels the team can push for a successful campaign next season. “It’s gonna be hard without [Labelle], who is a very good player that we’ve had for a long time.